At one with the "airiness" of competitive air guitar. "I think I was an air guitarist even before being given birth to. I think my father's [seed] … was actually [shredding]. It didn't have any hands of course, but you could sense the air guitar was there." WASHINGTON, D.C. -- Alas, my formative chromosomes were far less industrious. En route to the Miracle of Life, they weren't mock shredding to Van Halen's "Eruption." Nor were they faux typing the first three acts of "Hamlet." Which is possibly why I'm not on stage. And probably why I'm writing about air guitar. Excuse me. Competitive air guitar. With formal rules and snarky judges and a spot in the upcoming U.S. national championships on the line. Writhing and finger-plucking. Wagging tongues and balcony dives. Oh, and male shirtlessness. Lots of male shirtlessness. All of it taking place before hundreds of screaming, chanting spectators -- the on-site bar is doing brisk business -- with the lot of us packed into a well-known nightclub that otherwise hosts, you know, actual bands, playing, you know, actual music. Then again, tonight isn't about music. It's about world peace (really). And going to Finland (really). And headbands. (So many headbands). Mostly, it's about rock. Head-banging, face-melting, soul-devouring rock. The mysterious, ineffable feeling therein. What air guitar devotees creatively call … "the airness." Says performer The Shred: "It's art, adrenaline, athleticism. You get pumped so much." Says performer Sanjar the Destroyer: "It's like you're Super Shredder from the [Teenage Mutant] Ninja Turtles. You feel power. Like you could throw fireballs from your hands. It's something that can't be explained unless you're there." Says performer Juris Rocktor: "The airness is like Justice Potter Stewart's quote about obscenity -- you know it when you see it." Here's what I see from my spot on the club's balcony, where I stand behind a trio of judges: Tommy Fretless, fake-strumming atop the stage-side loudspeakers, sprinting around like an NFL draft prospect performing a three-cone combine drill, ending his 60-second performance by launching silly string from what appear to be homemade, Peter Parker-esque wrist-mounted web-shooters. Shreddy Boop, one of two female contestants, wearing a red headband, a red vest, black stockings, black knee pads, black briefs and a black cut-off T-shirt -- and still seeming overdressed. Another performer making like his family-unfriendly stage name -- hint: it combines "booger" with a bodily activity -- not so much playing his pretend instrument as caressing it, spending less time on his feet than on the floor, practicing what appears to be tantric yoga by way of "Headbanger's Ball." "The [blank] part outshined the booger part," decrees judge Adam Liptak, who also happens to be the Supreme Court reporter (!) for the New York Times. "Stop thinking, start rocking," advises judge Hot Lixx Hulahan -- real name: Craig Billmeier -- who also happens to be the 2008 air guitar world champion. Later comes Vlad DM Wailer, a tall gentleman of ample, pasty girth -- read: Chris Farley fat -- most of it straining against the surly confines of a too-small cherry mesh track suit. He thrusts a single finger skyward. On comes the music. Thirty seconds in, Vlad is kind of rocking; good thing, too, as his sweaty plucking and sweatier gyrations have tipped the battle between his outfit and Newtonian physics, with both his belly and plumber's crack now in plain sight. As a death metal mashup of Britney Spears' "Toxic" pummels my ears, I have to wonder: is this, in fact, the airness? Or just the after-hours equivalent of a chubby guys dancin' halftime act? The crowd roars. With delight, I think. "You need a full-length mirror. A metal T-shirt with the sleeves cut off. You need an iPod. And you need privacy." 3. Enter a competition playing "Eruption," and you definitely will get your tail kicked. "That's the quintessential song that any guy just starting thinks is like, 'Oh my God, I'll play it and blow everyone away,'" Sanjar says. "And it's like, 'Um, great, not again.' It's to air guitar what 'Don't Stop Believin' is to karaoke." Sanjar -- real name: Chris Paxton -- knows his stuff: he works as a karaoke host in his native Chicago. Three years ago, the 28-year-old saw the documentary film "Air Guitar Nation" on Netflix, then did what any right-thinking guy with shoulder-length hair would do -- quit his job as a waiter to pursue the national air guitar championship, the better to represent America at the annual world championships in Oulu, Finland. "I couldn't believe how serious the people in the documentary were," he says. "I wanted to scream, 'Nerds!' But then I realized I'm a nerd. And I'm really competitive, too. I felt like, 'I bet if I do this, I can beat them.' And then I just got more and more obsessed." Sanjar played his first show in Chicago. He got crushed. He played Minneapolis, Des Moines, New York. Took a beating each time. He went to the national finals in San Francisco, studied the competitors, stole their moves, realized the airness takes work. Practice. A game plan. Nobody good just gets drunk and wings it. (Note: Drinking is involved. And heavily encouraged). Air guitar may look like karaoke. In reality, though, it's more like "American Idol." • Technical merit. The more your invisible fretwork matches the music, the better. Sort of. "You need to know when to strum and when to shred," says Juris Rocktor, who plays actual bass guitar. "Otherwise, it's not that important." • Stage presence. Think charisma. Theatrics. Giant invisible inflatable pigs' heads. Rock star stuff. You have to get the crowd on your side. You have one minute to do it. Or else. 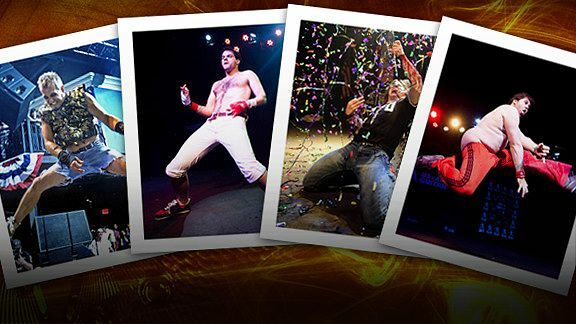 "If the crowd smells fear, they turn on you," says U.S. Air Guitar co-founder Kriston Rucker. "What does not work is, 'I'm a really good guitarist in my bedroom.' I tell new competitors, 'You have 60 seconds to put on a three-act play. Beginning, middle, end.' You're telling a story. People don't realize that at first." • The airness. "It's like the Jedi Force," Sanjar says. "Some people have it. Some people are like Han Solo and have blasters. Some people are Stormtroopers and can't hit the broadside of a barn." Right. That clears things up. "We do our homework," Rocktor says. "We go on YouTube and watch our performance and other people's routines. We take our public communion with the music seriously." For Rocktor -- real name: Mike Sacks -- serious means listening to his performance music every day while walking past the U.S. Capitol on his way to Georgetown Law School, mentally rehearsing his somersaults, his beer-spitting, the best way to stroke and kiss an air dove before biting its head off. For Sanjar, it means moving all his furniture to one corner of his apartment -- windmills and table lamps don't mix. It also means making like a stand-up comic, testing out fresh material at smaller bars and local competitions. Earlier this year, Sanjar debuted a new song in Milwaukee. Thought it would be dynamite. Only things fell apart. Literally. "Right before I started, my pants split down the front," he recalls. "I didn't have a change of clothes. I heard from a few guys, 'Hey, that didn't help you win?'" In air guitar, as in Super Bowl halftime shows, malfunctions happen. It's the price of pushing the envelope. Once, Rocktor had his girlfriend (really!) come to a show straight from a summer job at the Pentagon. Dressed in a power suit, hair held up with a pencil, she smeared peanut butter on Rocktor's chest, licked her fingers, pulled out the pencil and sashayed off stage. The crowd went crazy. (U.S. Air Guitar bylaws permit air roadies). Another time in Los Angeles, Rocktor performed as The President of the United States -- suit, tie, flag lapel pin -- to a musical refrain of I want your soul/I will eat your soul/I'm your daddy. Midway through, he bit down on the fake blood capsules he had stashed in his cheeks. "It was my first routine, so I had complete cottonmouth," he recalls. "I ended up spewing out red powder, nearly choking." Sanjar: The cartilage in her toe disintegrated. The skin was going one way, the bone the other. She had so much adrenaline she didn't know. At the end she hung her log over the balcony for everyone to see. And there was a toe missing. Rocktor: She won and went to the hospital. There was a lot of whispering that if she hadn't lost her toe, she wouldn't have won. Sanjar: That's [expletive]. But she did lose her [expletive] toe and gave air guitar a lot of headlines. The least she deserved was to go to finals for that. Rocktor: Last I talked to Bettie, she was thinking about competing again. She lives in Colorado now -- '08 was too much of an emotional and physical toll on her. Sanjar: She went underground. I saw it after it healed. She has like a pirate toe. "Hey, I broke my ankle jumping off that balcony right there," says The Shred, back in Washington. "It was doing the splits in midair. I turned it and it broke. I finished my act anyway." • Two "big cans" of Red Bull. "That's true," he says. "But no alcohol. Not at my age. One drink would slow me down. It's totally draining. You need energy. You don't want to be a tropical depression on the Doppler radar." An hour before the Washington show, The Shred is sitting in a small, second-floor room overlooking the stage. He wears cargo shorts and a black T-shirt, sports close-cropped graying hair and a long, vertical soul patch. Why is he here? To unleash, he says. Because air guitar is what he does. He claims he won about $10,000 in air guitar competitions in the 1980s. He's in the "Guinness Book of World Records" for conducting the most people simultaneously playing air guitar. He holds a yearly convention for fans of the rock band Rush … at his house. He's a member of two air bands, Air Force One and Category Sixx. The Shred pulls a folded-up sheet of paper from his pocket. Printed on it is a list of very real stage moves: 360-degree hop, pelvic twist, vertical pendulum, something called "The Scarlet Knight." "That's when I throw the guitar behind my back, then catch it," he says. "It rocks." I ask The Shred if he plays actual guitar. "Oh, hell no!" he says. "I've never played a damn thing in my life." "If everyone in the world was holding an air guitar in their hands, they couldn't be holding a gun. That's the most important thing to remember about air guitar." Anyway, this much is certain: the modern era of competitive air guitar began in 1996, when Finnish students held the first world championships at a music festival. Their stated goal was world peace. The modern era of domestic competitive air guitar was born seven years later, when Rucker and partner Cedric Devitt saw the world championships were indeed peaceful, but did not include American contestants. "It just seemed [expletive] up," Rucker says. "This is the home of air guitar. It was a moral obligation on our part. Also, we felt air guitar was something America could dominate without controversy." U.S. Air Guitar's first major New York City competition caught the attention of broadcasting icon Howard Stern. Stern's on-air plugs produced an onslaught of media coverage. In 2006, the William Morris talent agency came aboard, along with corporate sponsors like Schick and VH1. An aborted television project -- it's a long story; Rucker ultimately blames its termination on actress Liza Minnelli (!) -- provided footage for "Air Guitar Nation." Björn Türoque -- real name: Dan Crane -- wrote a book, "To Air Is Human," about air guitar. Today, the U.S. Air Guitar tour encompasses 16 cities and culminates in a July national championship in Manhattan. The winner goes on to the August world championship, which features competitors from more than 20 countries. "We consider this the fourth sport," Rucker says. "Sorry, soccer -- Beckham or no Beckham, it's not happening. We want to get on ESPN. They already have fishermen." "After a bit, you forget it's funny and weird and get into it being a competition," Rucker insists. "What would kill this is to make a joke of it. We let people make of it what they will. You don't hold an air guitar so much as you behold it." Backstage, the evening's competitors are wearing leather pants and spangled headbands, sleeveless vests and knee pads, wigs and double Mohawks. Sanjar sports a red T-shirt with a CNN headline reading "AIR GUITARIST LOSES TOE IN STAGE DIVE." The Airwolf of London has a UConn Huskies (?) chest tattoo. The Shred is almost unrecognizable: eyeliner, dog collar, jean shorts and a black vest stenciled with shiny gold revolvers. Just about everyone is nursing a longneck, and the vibe in the room is antsy. Hulahan -- the '08 champ and chief judge for the night, looks a little like Steve Nash -- goes over the rules. Everyone must sign an injury release form. Your guitar must be invisible. No props. Air roadies are OK. No lighting things on fire. Be careful about stage diving -- "If they didn't catch Bettie B. Goode," he says to nervous laughter, "they're not going to catch you" -- and watch out when putting your feet on the stagefront monitors. You'll likely fall right off, which is good for the judges. But not so great for your nose and teeth. "The judges get incredibly wasted and give the highest scores to those that rock the hardest," Hulahan concludes. "So if you don't know what you should do out there, just rock hard." The guy with the double Mohawk does pull-ups. Someone else pops a handstand against a full-length mirror. Sanjar slips knee pads over his jeans. He worries about the judges. Apparently, there are two schools of air guitar: a back-to-basics, unplugged approach -- favored by Sanjar -- and a theatrical, over-the-top approach, epitomized by reigning national champ William Ocean (not on hand in D.C.), whose calling cards are strobe lights, metal disco covers and riding spectators' shoulders while waving an American flag. "There's a lot of shenanigans with rewarding the theatrical stuff," Sanjar laments, shaking his head. "We sent a rep to Finland last year with a bullcrap routine. The rest of the world is playing air guitar, and we're trying to juggle or whatever. We can't win that way." Can't win that way? I have to wonder: Has air guitar reached a point of air decadence -- where it used to be about the music, man -- even though it was never really about he music in the first place? "No," Sanjar says. "Never. No matter how awesome or cool you think you are, or how good you are, it will never be that cool. Air guitar is still air guitar." "We'll spend hundreds of dollars on airfare and hotels for 60 seconds on that stage. It's that empowering. [Pause]. Also, if it was any longer it would be boring." The airness is not long hair. Even though that really, really helps. Almost as much as fringed, forearm-length bracelets. The airness isn't attempting to light your chest hair on fire, like contestant Fretty Krueger, even though that's pretty cool. It isn't doffing your top, like Juris Rocktor, Vlad DM Wailer (yipes!) and a half-dozen other competitors, even though that's mostly gross. It isn't running and jumping around like Richard Simmons, spitting beer into the crowd or imitating actual guitar playing in the manner of an ersatz Santana. Oh, and the airness is definitely not Dr. Fret Ning, whose costume consists of bare feet, a white lab coat and a stuffed animal kitten, the latter sawed in half and attached to the front of his white boxer briefs. The airness might be Sanjar, who seems to channel schoolboy steppin' Angus Young with a ripping faux rendition of AC/DC's "Kicked in the Teeth." It might be The Shred, who scores three perfect 6.0s -- not coincidentally, the number of the beast -- and has the crowd chanting his name before he even gets on stage. It might be Aristotle, a skinny, bespectacled teenager who resembles Harry Potter but struts and slithers like a young Mick Jagger, his spindly limbs embodying rock 'n' roll abandon. "This is airness, people!" says Hulahan, awarding Aristotle a 6.0. "He dropped his guitar, but it didn't matter. Because you were still watching him." Six contestants qualify for the final round, where they'll perform a surprise song. Sanjar advances. So do Aristotle, The Shred and Rocktor. Backstage, I spot Rocktor in the dressing room. He's putting on another T-shirt. I ask if he plans to tear it off. "No," Rocktor says, solemnly. "This is the only one I have left. I need something to wear home." U.S. Air Guitar defines airness as the extent to which a performance transcends imitation and becomes an art form in itself. Perhaps that's what it looks like. How does it feel? "It's the biggest rush," Rocktor says. "You're not fully liberated unless you're not being held accountable to any of the technical prowess that comes with playing. When you're onstage playing air guitar, there's nothing between you and the audience. What's there is what you get them to imagine. If you're lucky, your fingers do all the talking." In the 1970s, Italian philosopher Umberto Eco wrote about "hyperreality," realistic fabrications intended to one-up the world as we know it -- faking things to make life more beautiful, more exciting, more interesting. What better description of a novel? Or "The Real World"? Or "Madden" football games? What better description of air guitar? Air guitar is not just for people who can't play guitar but want to. It's like two different instruments, really. The Shred catches his guitar, eyes twinkling. The song crescendos. The crowd erupts. The judges feel it. Everyone does. This, I realize, is air guitar. A different instrument, really. The line between authentic and fake -- between the tangible and the imaginary -- is neither smudged nor blurred nor erased. It's simply irrelevant. Here is Kasten: a middle-aged father wearing eyeliner and a dog collar, resembling a frat boy on Halloween, or maybe the victim of a particularly successful practical joke. And here is The Shred: a 60-second face-melting demigod, at one with the airness, rocking harder than anyone with a real guitar ever could.